This quiz contains 10 multiple choice questions over plant and animal adaptations. An answer key is also included. It correlates to the Georgia Performance Standards for 3rd grade science. This is a quick quiz for assessing student mastery of animal adaptations. This includes distinguishing between structural and behavioral adaptations. 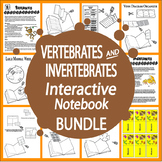 This quiz also includes the terms cells, hibernation, and vertebrate. Quick quiz to assess vocabulary. 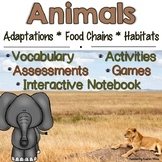 Also has students sort various adaptations into "Physical Adaptations" or "Behavioral Adaptations" columns. This is a quiz on animal adaptations. This quiz is aligned with the science Georgia performance standards for third grade. The quiz consists of 15 questions and a bonus. 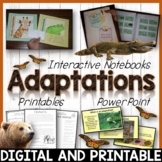 This is a great way to see if the students understand animal adaptations. Hope you enjoy! This is a quick one page quiz that I use to check my students understanding of basic animal adaptations vocabulary. A simple fill in the blank with a word bank! Perfect to use as a quiz or even as homework or review! 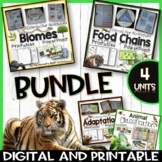 Quiz to assess student understanding of basic animal needs, structural and behavioral adaptations, characteristics of living and nonliving things and related vocabulary. Product includes two options for printing and an answer key. A brief quiz (with answer key) on animal adaptations. Quiz on animal adaptations. Includes multiple choice, short answer, and true/false questions. This is a six question animal adaptation quiz to use as a formative assessment.